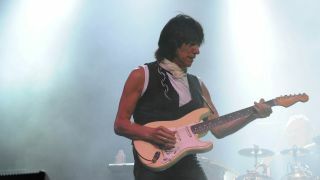 Jeff Beck has an utterly unique approach and sound, coaxing beautiful, seemingly impossible sounds from his Strat. His love for the Mixolydian mode, combined with his infamous whammy-bar scoops and doops, is explored in tracks such as The Pump and Freeway Jam. His tapping skills combined with Indian-style melody can be found in tracks such as What Mama Said and THX138. Big doublestop riffs can be heard in anything from Big Block to Seasons. If it's Jeff's signature pure melodies and harmonics you're after, look no further than Nadia and Cause We've Ended As Lovers. Check out recent performances of early tracks to see how he has adapted them for fingerstyle and whammy-bar use. You'll need your guitar in drop D tuning for our first example. The riff uses several two-note chords to help spell out the D Mixolydian mode (D E F# G A B C). Use your thumb to pick the sixth string, your first and second fingers for the doublestops and your third fingers only on the higher strings. As well as subtle use of the whammy bar for Indian-style sounds in bars 1 and 2, each of these four bars targets important chord tones such as the root note, the 3rd and the 5th. Use your thumb and first finger for the melodic run in bar 3. Jeff's unique way of approaching simple bluesy harmonica-style 3rd ideas such as this is to pivot between his thumb and index finger. This idea targets the important major 3rd (4th fret F#) and flat 7th (10th fret C) from the D Mixolydian mode. Make sure to mute the idle strings. This subtle approach is central to a lot of Jeff's playing. The idea is to use the whammy bar to change smoothly from note to note, much like you would do if you were using a slide. Pick with your thumb and first finger, and use the three spare fingers of your pick hand to control the bar. If you fancy going the whole hog, you can also use our handy gear and guitars shopping list to Buy Jeff Beck's sound.